Total Safety Services can provide your employees with the highest possible level of protection whilst working offshore. 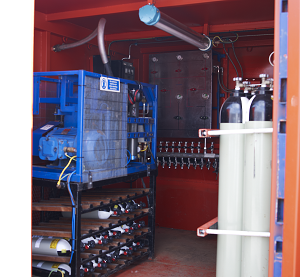 With our custom built Breathing Air Cascade Systems, we can provide you with the perfect solution to your offshore breathing air and safety requirements. Our units exceed all required regulations and manufacturer’s recommendations in both the working duration available and flow-rate. A high pressure air compressor used for refilling the cascade unit and SCBA cylinders that can also supply an unlimited amount of air to the drilling platform or offshore installation. A cascade unit with 15 x 50 litre steel cylinders allowing over 60 hours of stored breathing air without the need of refilling the cascade unit. This feature is critical as the high pressure air compressor cannot be used whilst toxic and/or flammable gases air present in the atmosphere. Supply hoses to transport breathing air around the drilling platform or offshore installation. 6-outlet manifolds to allow multiple users to connect into the air supply around the rig in case of emergency gas escapes. Retractable hose reels to allow quick plug-in connection and maneuverability when gas escapes occur. 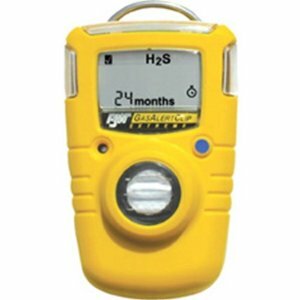 Battery powered wireless and wired area gas detectors can be used for detecting hazardous gases such as H2S and other toxic and flammable gases. The units can connect together to create a perimeter for gas monitoring, allowing all units to alarm when hazardous gases are detected by one of the units, which in turn offers all crew members a higher level of safety. Different types of personal gas detectors can be attached to personnel’s clothing to detect a variety of gases. These units come in the form of single gas detectors and multi gas detectors to ensure that your safety requirements are met.